memory of their friend’s father. Stephen Parkinson, 62, passed away at the hospice on 21 March 2017 after being diagnosed with bladder cancer in September 2015. After spending time at the hospice during her father’s two week stay, Stephen’s daughter Sarah wanted to give something back. 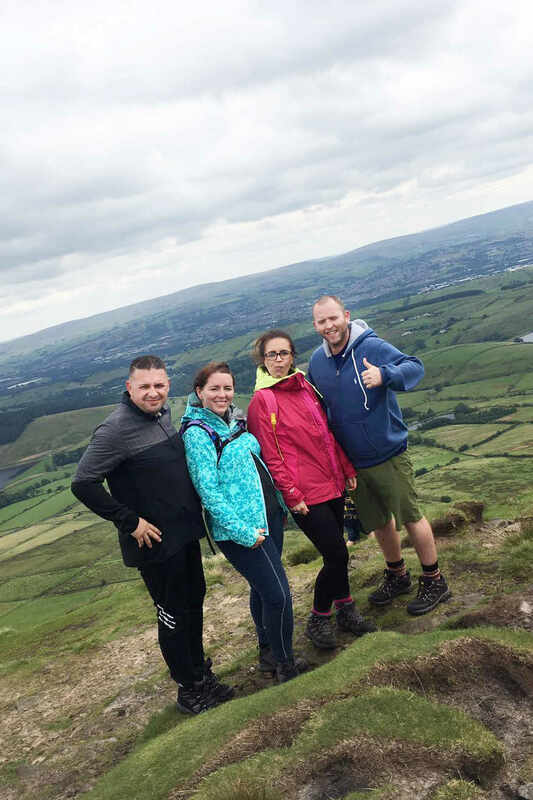 Sarah Bentley, 34, of Lower Darwen was speaking to friends about arranging a fitting tribute to her Dad, and the climb was suggested. Four couples, including Sarah and her husband Chris, Kelly and Phil Harrison, Rob and Georgina Longman, Vicki Hargreaves, Nick Wild and Graham Kenyon will be part of the team ‘The Ben Nevis Nutters’. Stephen had also raised a lot of money for various charities in his lifetime. almost halfway there, with £1,500 being donated to date. Nevis is more than five times the height of Pendle Hill so it’s a bit daunting but I’m excited. “My nine-year-old daughter, Lilly, has been coming along for moral support and to help keep me motivated! ‘too final’ however once he was there, he was so much happier and never once asked to come home. end of life care provided by East Lancashire Hospice.